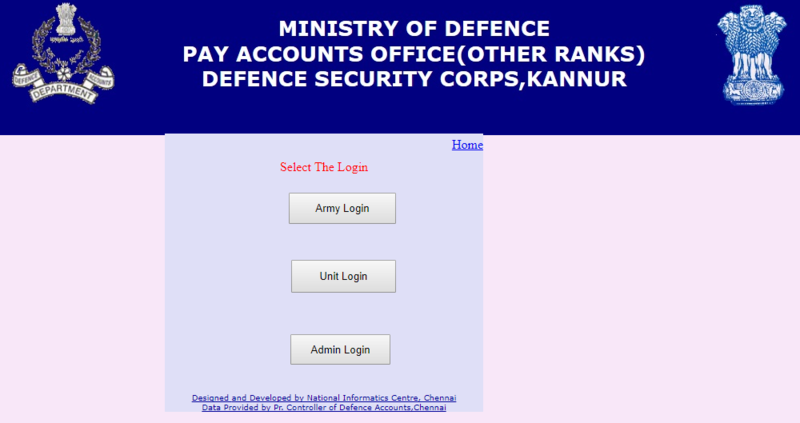 How To Check Indian Army DSC Salary Slip – Payslip Online Download: This article is for all DSC(Defence Service Cops) and Indian army jawans who wanted to see their payslip online. Their is online facility available for all jawans that they can easily check and print their Payslip easily. So if you are one of them who don’t have any idea about how to check Army Pay Slip & DSC Pay Slip online then you don’t have to worry about it. Here you will get all easy steps to check payslip with unit code and password. We all know about the Indian army, but do you know about the DSC? DSC(Defence Service Cops) provides armed security staff, static guards. Searchers, escorts and mobile patrols by night and day. It is a 6th biggest corps of the Army. DSC is joined by the ex-army, ex-navy and ex-territorial army quota. After the retirement many jawans joins the DSC. So if you are too from the Indian Army and DSC post than here you will surely get all the details related to the Army DSC Salary Slip – Payslip Online. So here are some steps about How To Check Army DSC Salary Slip – Payslip online, if you follow these easy steps you will get your salary slip easily. when you visit this link paodscknr.gov.in/home.aspx you will get website home page like this. After landing in official website, you will get 3 option to login. you have to click on unit login. Now fill unit no. and password. Which you has get from the army. Than you can easily check and print your salary slip. If you forgot your password than you have to contact your Administrator to reset your password. All Army people who are looking for the DSC Job after the retirement should know the salary package, pay scale, basic pay, grade pay. So check here the Pay Scale and allowances are as per Regular Armed Forces personnel. For any query leave your comment in the below comment box. It will be solve as soon it’s possible.